Evan receives his Scholarship certificate from Dr. Semco! 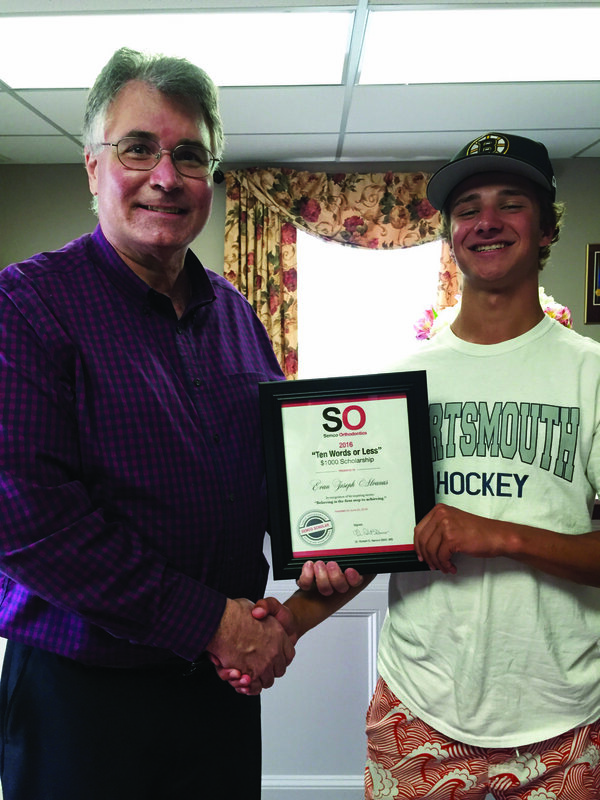 Portsmouth High School (PHS) student and athlete, Evan Alvanas, is the recipient of the third annual Semco Orthodontics “10 Words or Less” $1000 College Scholarship. In the late nineteenth century, lists of questions were a popular diversion designed to discover new things about old friends. When the famous French author Marcel Proust was 14 years old, his friend Antoinette asked him a list of 35 questions to get to know him better. One question that was asked of Proust was “what is your motto?” That was the question posed to scholarship applicants this year. Evan plays hockey and lacrosse for PHS and plans to participate in intramural sports in college. He has been accepted to Michigan State University where he will study Engineering.